Booklet. Series edited by E. Haldeman-Julius. 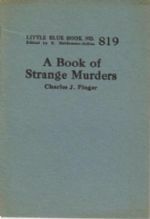 Featuring 10 cases : The Overbury Case; The Case of Marie Schneider; The Case of Gabrielle Bompard; The Bellingham Case; Laws Unto Themselves; The Case of John Williams; The Case of Eugene Aram; The Strange Case of Catherine Hayes; The Case of a Paranoiac; Murders in Civilization's Name. 59pp. booklet With a personal b/plate, sl. sunned covers o/w Vg+.